Revelation 3:15-16, “I know thy works, that thou art neither cold nor hot: I would thou wert cold or hot. What hypocrisy! What a blatant contradiction! Bob Jones University claims to believe that God has “supernaturally preserved every one of His inspired words for us today,” yet they also claim, “we have never taken the position that there can be only one good translation in the English language.” Then BJU has a big problem doctrinally, because there are literally HUNDREDS of English Bible versions, and they differ in content DRASTICALLY!!! How can BJU claim to believe that God has “SUPERNATURALLY PRESERVED EVERY ONE OF HIS INSPIRED WORDS IN THE ENGLISH LANGUAGE,” while at the same time tolerating a plethora of English Bible versions that completely contradict each other in words and meaning??? It is utter apostasy! If, as Bob Jones College asserts, God has “supernaturally preserved” His inspired words in multiple modern Bible revisions, then WHICH ONES? Bob Jones makes a bold statement, but then doesn't back it up. You cannot just claim to believe there are more Bibles than the King James Bible, but refuse to specify which ones. Does BJU think the Alexandrian texts are inspired? Yes, that is exactly what they are saying, and they are pulling on the same rope as the Devil by doing so. I've been in churches pastored by Bob Jones' graduates, who use the satanic Easy-To-Read Version (ERV), which is translated from the corrupt Alexandrian manuscripts. What kind of “Bible college” cannot decide which Bible is the genuine McCoy amongst literally hundreds of English Bible versions? It is apostasy!!! God said he spits out “LUKEWARM” churches! I cannot think of anything more “lukewarm” than straddling-the-fence in the matter of the Bible version debate. God only authored ONE BOOK!!! Psalms 138:2, “I will worship toward thy holy temple, and praise thy name for thy lovingkindness and for thy truth: for thou hast magnified thy word above all thy name.” Seeing that God magnifies His Word above all His own holy name, I'd say the holy Bible is an important matter to fight over!!! 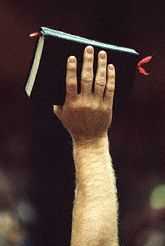 The 1984 New International Version (NIV) changes or removes over 65,000 words from the King James Bible. Their latest 2011 NIV changed 38.8% of the content as compared to the 1984 NIV. In early September 2016, the publishers of the ESV translation said they had updated their revision, and these changes were FINAL. But wait a minute! Just weeks later, by the end of the month, they turned around and said these changes were not final. You couldn't make this stuff up... change this, change that, where does the Merry-go-round stop? They CHANGED Their Mind AGAIN! How does this travesty of Bible mistranslation reconcile with BJU's claim of divine preservation in more than one English version? How does God preserve EVERY ONE of His inspired words in 900 different Bible versions? Our churches are going to the Devil, perverting what it means to be saved, because of the corrupt new Bible versions that redefine repentance to mean a change of lifestyle rather than a change of mind. Here's the ugly truth about Bible versions! Here's another example of corruption: The modern Bible revisions teach baptismal regeneration by completely removing Acts 8:37. Please understand my motive in writing this article. I am simply warning others that Satan is tampering with our spiritual food, which is the Word of God. BJU wants to maintain the appearance of believing that God has faithfully preserved EVERY ONE OF HIS INSPIRED WORDS IN THE ENGLISH LANGUAGE, while at the same time catering to ecumenical apostates by saying that they support more than one Bible translation. Ok, which ones? Which Bible(s) are good besides the King James Bible? Are they all good? Which ones can we trust? 'Com on, if anyone should know it's a Bible university!!! They dare not tell you, lest they make enemies in the religious world. I thank God that I'm outside the gate with Jesus and the King James Bible only crowd!!! I'm tired of Bible colleges claiming to believe that the Bible is the inspired pure Words of God, while endorsing dozens of satanic Bible versions which ALL DISAGREE THEOLOGICALLY. You cannot have it both ways. Either we have a perfect Bible translation today or we do not. Does God expect us to figure out where His “very pure” words got lost in the mix? Psalms 119:140, “Thy word is very pure: therefore thy servant loveth it.” Do you really expect me to believe that somewhere in the vast sea of English translations that God's Word partially exists, a little over here and a little over there? What BJU claims to believe is utterly contradictory and confusing. How can we have EVERY INSPIRED WORD of God, supernaturally preserved, if we don't have one perfect Bible??? I do believe that God has preserved every word in the King James Bible (the Textus Receptus Greek), and all other versions that originate from Brooke Westcott and Fenton Hort's Alexandrian 1881 Greek manuscripts are corrupt. A REASONABLE CONCLUSION: For any Bible college to support multiple Hebrew and Greek manuscript sources (which you would have to do, to support dozens of English Bible versions), while contrarily professing to believe God has supernaturally preserved EVERY ONE OF HIS INSPIRED WORDS, speaks volumes as to their indifference, lack of conviction, lack of scholarship, hypocrisy and shameful spiritual condition. To say that God has supernaturally preserved His inspired Words amidst hundreds of English Bible versions is IMPOSSIBLE, because the different versions often drastically contradict each other doctrinally. it's the right One by the way. You can tell a lot about something by its enemies and critics.” —Pastor Danny Castle, a quote from the needful sermon, Procrastination: The Devil's Best Trick. Either Jesus is the only “begotten” Son of God or not. The King James Bible says “BEGOTTEN” in John 3:16, but all the new fake Bible versions don't. They removed the word completely, thus perverting the truth. My friend, what I'm about to show you is 100% PROOF that Satan is behind the New International Version. In the 1984 NIV, Matthew 21:42 changes Jesus from being the “head of the corner” to the “CAPSTONE” (look at the top of the pyramid on back of a U.S. one dollar bill. The All Seeing Eye of Lucifer is in the Capstone). Clearly, the 1984 NIV refers to the coming Antichrist, Alice Bailey's Christ (whom she mentions 666 times in her popular book, The Externalisation Of The Hierarchy). The ancient occult mysteries and the New World Order are being revealed to mankind. Satan's kingdom of darkness is being brought to light, and the sinful world being prepared to embrace the coming Antichrist. A world of sin will receive the man of sin! It is not a coincidence that only in the past 100 years has Satan published literally HUNDREDS of English Bibles (and they're still coming). Either people worshipped Jesus, or they merely knelt before Him. In Matthew 8:2 the King James Bible says a leper worshipped Jesus, but the new Devil's Bible versions merely say he knelt before Jesus. You can kneel before a king without worshipping him. Please only use the King James Bible and cry aloud against the counterfeit Westcott and Hort Bible versions which attack Christ's deity, remove the Godhead and diminish Jesus' preeminence. The TRUTH, if you want it, is that ALL modern English Bible versions are translated from the Satanic Greek work of reprobates Westcott and Hort. Only the precious King James Bible comes from the Textus Receptus. According to BJU's foolishness, they would have us to believe that God has preserved His words through both the Textus Receptus (from Antioch, Syria) and the Westcott and Hort manuscripts (from Alexandria, Egypt). Here's a chart. Which is it? These two Greek sources differ drastically, and for all we know, the Alexandrian manuscripts were a big fraud, like Westcott and Hort (both unsaved reprobates). Does it matter what we believe as Christians? I think it does, which is why I am writing this article. The Word of God is more dear to me than anything else in this world, and I'm not going to sit back while ungodly sinners spiritually ravish it and rip it apart!!! We are at spiritual war as Christians. Ephesians 6:12 tells us that our enemies are the rulers of the darkness of this world. That would certainly include the Globalists who've hi-jacked The White House, Pentagon and federal government. The world is our battlefield, not our playground as Christians. A police state is quickly rising up in America. I guarantee you that BJU will go along with the coming LGBT laws to avoid losing their tax-exempt status. It's just a matter of time. The whole country has gone to ruin, primarily because Christians stopped fighting long ago. We are content to sit inside our nice churches and go along to get along with the Devil's crowd. We've bought into the Devil's lie of 501c3 state-licensing, effectively silencing the churches and religious institutions. Sadly, most Bible colleges today, including Independent Fundamental Baptist colleges, are silent and refuse to take a Biblical stand anymore against corrupted Bible versions. You are not doing anyone a favor by letting them continue down a wrong path in apostasy. Shame on the pastor who refuses to expose corrupt Bible versions, using the excuse that he doesn't want to offend baby believers. Really? You mean you'd rather let them continue using a Satanic, corrupt, counterfeit, Bible version? Such wayward pastors are either big cowards, sinfully compromised for the love of money, woefully ignorant, or they just don't care at all. Woe unto today's apostate pastors! Woe unto the silent Christian! God gave me a mouth, fingers to type, an internet connection, and the opportunity to warn others... BLESS GOD, I'M GOING TO SPEAK UP FOR GOD!!! God deliver us from today's sweet, kind, likeable, seemingly wise, mellow, GUTLESS PREACHERS who don't preach the truth as they ought!!! God give us some offensive John the Baptists!!! Jesus said that the whole reason He came into the world was to bear witness unto THE TRUTH!!! John 18:37, “Pilate therefore said unto him, Art thou a king then? Jesus answered, Thou sayest that I am a king. To this end was I born, and for this cause came I into the world, that I should bear witness unto the truth. Every one that is of the truth heareth my voice.” The world doesn't listen to the voice of Jesus. What is the voice of Jesus? It is the Word of God of course. In John 1:1-3 we learn that Jesus was not only in the beginning with God, but Jesus also was [is] God. John 1:14 says that the Word became flesh (incarnate) and dwelt among us (the Lord's earthly life), and we beheld His glory as of the only begotten Son of God. By the way, all of the new counterfeit Bible versions completely remove the word BEGOTTEN, attacking the deity of Jesus Christ. When I think how BJU won't make a fuss over such perversions of the Scripture, and they are silent as the Devil rapes the Bible, it makes me sick to my stomach. No one respects God who promotes multiple conflicting Bible versions! The Bob Jones crowd and their associated pastors hypocritically preach about the importance of THE TRUTH, while using and promoting (even publishing) multiple Bible versions, which confuses everyone. The man with two watches never knows what time it is! Likewise, the man with more than one Bible doesn't know what the truth is!!! Silence is Not Golden, it is Yellow Cowardice! May I say, I have far more admiration for a Baptist pastor who exposes corrupt Bible versions but denies a pretribulation Rapture, than I do for a pretribulation preaching Baptist pastor who is silent about the corrupt Bible versions destroying our churches today. The great need of the hour is for preachers to wake up to the spiritual attack going on in our churches today. All across America shameful pastors are bringing Calvinism into the churches by promoting Dr. John MacArthur. Woe unto the preachers who teach Lordship Salvation, which is a false plan of salvation!!! Let's just be honest, most churches today are crap! I am familiar with a local Bob Jones University affiliated Baptist church who are corrupt as can be doctrinally. They teach Lordship Salvation, which is a works-based road to Hell. They promote Dr. John MacArthur, even passing out MacArthur's study materials. They support Evangelist Paul Washer, who teaches that without works no man can enter into Heaven. The church supports AWAB. I'm talking about an Independent Baptist Church here! They use the Easy-To-Read PERversion of the Bible alongside the King James Bible (they use a double Bible, one true and one false). Talk about utter confusion!!! Ironically, they look down their long Pharisaical noses upon anyone who takes a stand against their apostasy, while in reality they're the ones who are in trouble with God for rejecting the truth. But hey, the religious school is growing and the money's flowing. Let the goodtime roll! “To hell with truth” they say by their woeful actions! In eternity on judgment day, such shameful apostates will fall on their knees in shame, tears and fear before the very God they errantly think they serve! My friend (I am being your friend), you are NOT serving God if you tell people how to go to Hell with Lordship Salvation. Here's what MacArthur teaches. You are NOT serving God if you use, promote and remain silent about the Satanic Bible PERversions infecting most of today's dead churches. God's Word is very pure and incorruptible. Psalms 119:140, “Thy word is very pure: therefore thy servant loveth it.” The NIV changes 64,000 words as compared to the trustworthy King James Bible. The NIV is truly the Antichrist's Bible! The Word of God is the INCORRUPTIBLE seed by which we are born-again. You cannot be born-again by corrupted Scriptures. 1st Peter 1:23, “Being born again, not of corruptible seed, but of incorruptible, by the word of God, which liveth and abideth for ever.” I once had a foolish Bob Jones Graduate attempt to defend the new corrupt Bible versions by asking me if I believed some people are getting saved from a New International Version (NIV). The answer is a resounding, “NO!” The truth is that many Christians who grew up hearing the trustworthy King James Bible (KJB), have gradually transitioned into the new corrupt Bibles, but falling back on their knowledge of the King James Bible for sound doctrine. What they fail to understand and see spiritually, it that this new generation has nothing but the new corrupt Bible versions, and so they are doomed!!! Today's Bible versions in most cases don't mention the name of Lucifer. If you know about the name of Lucifer, you didn't get it from most of the new Bibles, because the word is completely gone!!! The word “begotten” in John 3:16 is gone from the new Bibles, rendering the new versions satanic heresy, because every believer is a son of God (John 1:12). A believer is an adopted son (Romans 8:15), but Jesus is the only begotten (biological) Son of God. If your pastor is okay with the new corrupt Bible versions, or is silent about them, please find another church that cares about the truth. If going to church is a mere religious activity, where people can sing, fellowship and feel good about themselves, then you are much better off just staying home!!! BJU hypocritically claims to believe that God has supernaturally preserved every one of His inspired words for us today, while at the same time saying they don't believe there's only one good Bible version in English. Huh? Are you serious? Which Bible's can we trust? Since BJU doesn't tell us which Bible versions can be trusted, they clearly are OK with all of them. If I had my way, I'd fire everyone on BJU's staff and hire only born-again Christians, King James Bible only, who mean business for God to replace them! I ask you again... does it matter what we believe as Christians? The Bible is at the heart of everything we believe. If I were the Devil, I'd slowly change the Word of God into a lie, undetected from one generation to the next. That is what's happening in America. I'm tired of fools calling Dr. Jack Hyles, myself and other King James Bible only Christians “a cult,” while they hypocritically tolerate, use and support dozens of English Bible versions that were translated on the ungodly basis of accommodating some legal copyright law. Don't you get it? All these new Bible versions only differ in content so that the ungodly owners and publishers could copyright their work of darkness to make a buck!!! They deliberately changed the Word of God to get their piece of the money-pie!!! It upsets me that today's Bible colleges, churches and professed Christians don't care, going along to get along, not taking a stand for THE TRUTH!!! There's nothing more important in a believer's life than the Word of God, which is why I make a fuss and will continue to harp, holler and hound against the Devil and his minions who corrupt the Bible, which they do for monetary gain. Woe unto the wicked! Go to Biblica's website (the monsters behind the NIV) and you'll discover that when the Committee On Biblical Translation (CBT) began their work on the NIV, they invited several dozens different religious denominations (sects), to ask them what revisions they wanted to see, and that's how the NIV was born. What evil wickedness!!! Please read, NIV: The Bible Version That Keeps Changing! God authored the Bible with brutal honesty, which was intended to be highly offensive to sinful man. It is only when a Christian man loves God Word that nothing in the Bible will offend him. The heathen world hates the Holy Bible, because they are unholy. And may I say, kindly but truthfully, any church that does not believe in the verbal inspiration (i.e., every word is inspired) of the King James Bible is NOT a New Testament church!!! Dr. Jack Hyles said that and he is 100% right!!! The fact that BJU, MBI and other Bible institutions have become lax, nonchalant and indifferent concerning the literally hundreds of different English Bible versions is alarming, and shows the utter extent of the apostasy in churches these days!!! We should all be panicking, just as if you caught a man putting poison into the baby bottles in a church nursery!!! The Bible is our spiritual food, which means that most churches have spiritual food-poisoning today!!! The churches are sick, many are dead and others dying. Instead of preaching the simplicity that is in Christ as men of God used to, nowadays unsaved reprobates are requiring sinners to change their own life before God will save them. What Satanic wickedness!!!!!!! This is partial faith in Christ plus human effort for salvation. In an effort for many pastors to sinfully reconcile the truth with Satan's lies, then often say retarded things from the pulpit like... “Eternal life is a gift and you cannot earn it, it is by God's grace, but if you're still living in the old ways of sin you're not really saved.” What a contradiction!!! By the way, that's what Jehovah's Witness' teach! Others will say something like... “You're not saved by works, but if you really got saved there will be works.” Such unbiblical statements condition salvation upon human performance. How you live before or after being born-again (saved) has absolutely nothing to do with how you live your life. That's what discipleship is all about (Romans 12:1-3), and the Judgment Seat Of Christ (2nd Corinthians 5:9-11). Eternal life is a free gift, period. You just receive it through faith in the death of Christ on the cross for your sins, His burial and bodily resurrection three days later. Believe the Gospel and the work is done. Repentance is the realization that you are a guilty sinner in God's holy eyes for breaking His commandments (Romans 3:19), which compels you to believe on the name of the Lord Jesus Christ for forgiveness and salvation. Repentance is a change of mind that prompts one to believe the Gospel, and not a prerequisite to turn away from sinful behavior (to change one's life) in order to qualify for salvation. I am numbed more-and-more each day as I read books and listen to sermons by theologically flawed religious leaders (they're certainly not born-again Christians) who teach Lordship Salvation. A sore evil in our religious circles today is to dismiss such major theological differences as mere semantics, which is an ecumenical ploy of the Devil. The simplicity that is in Christ (2nd Corinthians 11:3-4) does not include the complexities of forsaking sinful bad habits. The fact that Moody Bible Institute (MBI) publishes all of Dr. John MacArthur's books is alarming. So all those churches who promote Moody radio feel compelled to go along with Moody and MacArthur, when they should all be exposing them for their heresies and contending for the faith. This is why Jesus said no man can serve God and mammon (wealth), because he will love the one and hate the other. There is no middle ground here. Are you lukewarm? God pukes out lukewarm believers, because they make Him sick!!! Although BJU thinks itself noble for sticking with their original beliefs when the university began in 1927, the truth of the matter is that Satan's hands have been very busy corrupting the Word of God over the past century. The Bible scene has drastically changed since 1927. Although there were corrupt Bible versions in 1927, influenced by the heretical work of Westcott and Hort, they weren't nearly as corrupt as today's Bible versions. The second publishing of the New International Version (NIV) in 1984 took the religious world by surprise, opening the eyes of many preachers to what the Devil was doing, removing the ancient landmark (the unchangeable Words of God). Satan can corrupt Bible versions, but he can never corrupt God's Word! So, it is actually a shameful thing that BJU has sat idle while the Devil has been changing the Word of God into a lie (Romans 1:25). And that goes for all Bible colleges, churches and religious institutions; we all have a Christian duty to refute all works of darkness (Ephesians 5:11). There are only two groups of people in our churches today: 1) Those who believe that the King James Bible is God's inerrant, perfect, infallible, inspired and preserved words; and 2) Those who don't believe that we have God's pure words today! Check into what Moody Bible Institute (MBI) believes about God's Word and you'll be shocked. It is shameful what BJU believes about the Holy Bible. It couldn't be more obvious that BJU either just don't care, or more likely, they prioritize the business of religion over the integrity of God's Word. There are hundreds of English Bible versions and they cannot all be God's supernaturally preserved Words, unless God were an idiot. I mean, if I am a passenger in your car and you ask me which way to turn, and I say both left and right at the same time, you'd be confused and question my sanity if I were serious. I've known professed Christians with a dozen different Bible versions on their bookshelf. When they read the Bible and don't understand a particular Scripture, they consult several different versions for understanding. That is a recipe for disaster!!! So instead of gaining understanding of the truth, they are given a false sense of hope, ignorantly going away thinking they understand when they don't. They are now not only woefully ignorant of the Scripture passage, but also blinded with a false interpretation. Folks, anything worth doing is worth doing right, or else why waste our time? God is not the Author of confusion. Ask your local Bible college where they stand on the Holy Bible and you will likely be shocked. In all likelihood you'll open a can of worms. They all believe and teach that we DON'T have a perfect, faultless, infallible, inerrant, Bible today!!! You can largely thank the Satanic reprobates, evil occult members of secret societies, Brooke Westcott and Fenton Hort for that! There's Only One Plan Of Salvation, Not Two! Unless you believe that there are TWO different plans of salvation, you can only conclude that those foolish pastors and religious teachers are unsaved who require forsaking BAD WORKS to be saved. Whether requiring a person to do GOOD WORKS (like Roman Catholics do), or requiring a person to stop doing BAD WORKS (like John MacArthur, Paul Washer, Ray Comfort and Billy Graham do), to be saved, BOTH require DEAD WORKS. The Holy Bible has a built-in dictionary, which if you use will keep you from going astray. I speak concerning the trustworthy “Textus Receptus” Greek and the “King James Bible” which is translated from it. In sharp contrast, ALL modern Bible versions (which are translated from the Alexandrian manuscripts - an entirely different Greek text) are corrupt and THE BUILT-IN DICTIONARY IS GONE!!! I will prove it to you right now. I plead with you to hear me out, please! I wish I could grab every pastor and shake some sense into him, because Satan is destroying the churches by changing the Holy Bible. A big building and a large congregation mean absolutely nothing if the Word of God has been corrupted!!! If I had my way, I'd fire every pastor and assistant pastor who are so woefully ignorant, indifferent and/or cowardly that they support the modern corrupt versions. THERE ARE NO GOOD MODERN BIBLE VERSIONS that come from the Alexandrian manuscripts prepared by Brooke Westcott and Fenton Hort in 1881! Repentance is from DEAD WORKS, that is, trying to keep the law to earn Heaven. If you look at the Textus Receptus Greek for the phrase “DEAD WORKS,” you will discover that “dead” is the Greek word nekros, which means exactly what it says, “dead.” The word “works” here in Hebrews 6:1 is the Greek word ergon, which means “to work, toil.” Clearly, there is no mention of forsaking a sinful lifestyle to be saved, which would constitute human effort necessary for salvation. This is not to say that we have God's permission to sin as Christians, God forbid (Romans 3:31; Hebrews 12:6-8; 2nd Corinthians 5:9-11). That is wrong, wrong, wrong! You don't have to change your own life as a requirement to be saved. Rather, it is the indwelling Holy Spirit that comes into a person at the time of salvation that changes one's heart and life, over time as they grow in grace by nurturing on the milk of the Word (1st Peter 2:2). Initially, getting saved does not change a person one bit, except that now you have the Spirit of Christ living inside your body (Romans 8:9; 1st Corinthians 3:16-17; 1st John 4:4). It is the Lord's Holy Spirit working in us that changes our life, but this is not a requirement to be saved. You see, the ERV is teaching doctrines of devils, requiring people to change their own life (which is human effort) as a requirement to be saved. This is reformation, which does not bring regeneration (the new birth). Again we plainly witness, that the Luciferian groups which have provided the Greek manuscripts for today's versions, are pushing an agenda of including human effort for salvation. You must understand that there is a progression at work in the Bible-corrupting movement. This is why the NIV 2011 changed its content 38.8% as compared to the NIV 1984. The Bible corrupting gang won't ever be finished changing the Bible until the Antichrist appears. If the Lord tarries His return, we are going to see further assassination of the Word of God. We'll see more key passages concerning salvation changed, until the simplicity that is in Christ will be totally lost in the confusion. This was Satan's plan from the start. I'm using the “Easy-To-Read” (ERV) PERversion, which is popular in many churches today, but the same corruptions are found in the NIV and nearly all Bible versions today. Please wake up and realize that these are VERSIONS, and not the HOLY BIBLE! Let's examine another passage of Scripture in the pathetic ERV that changes the plan of salvation . . . There is a drastic difference between confessing “the Lord Jesus” verses openly saying, “Jesus is Lord”! Nowhere in the Holy Bible are we taught to recognize Jesus as our “Lord” to be saved. You simply trust Jesus as your Savior and then He automatically becomes your Lord. Whether you obey Him or not as a disciple is an entirely separate matter. This is why the disobedient saved man in 1st Corinthians 3:15 was “saved; yet so, as by fire.” He barely made it, singed with the flames of Hell. This Christian man lived a wasted life, and so he received no rewards from the Lord at the Judgment Seat Of Christ. Clearly, he didn't confess Jesus to anyone. Nor did he honor Christ as his Lord during his earthly life. 1st Timothy 4:10 says that Jesus is the “Saviour” of all men, not their Lord. Many foolish Bible students attempt to use Saul's conversion (Paul) as a benchmark for all conversions, which is very wrong. Saul had been running from God, wasting the Church, hunting down Christians to murder them. So when the Lord appeared to him on the road to Damascus in Acts 9:1-5, Saul was under much Holy Spirit conviction and finally broke. It was Saul's unique Pharisaical upbringing and religious background that prompted him to have the spectacular conversion experience that he did, but this is far from the normal way that people get saved. Most people just quietly receive Christ as their Savior, with no spectacular experience. Furthermore, the KJB simply teaches that we confess with our mouth because we are saved. It would be wrong to add confession with the mouth as a requirement for salvation, when literally hundreds of other passages of Scripture tell us how to be saved, and not one of them mentions confessing with the mouth to be saved. Clearly, Romans 10:9-10 do NOT teach that a person must confess “Jesus is Lord” to be saved. This is a horrible PERversion of the Word of God. The ERV is satanic! And again, the chief rulers in John 12:42 believed on the Lord to be saved, but they DID NOT CONFESS HIM for fear of being kicked out of the synagogue by the wicked Pharisees. The Bible says that these chief rulers, who were saved, loved the praise of men more than the praise of God (John 12:43). The Scriptures are filled with worldly believers who dropped the ball for God. In Romans 12:1, the Apostle Paul is pleading with the Christians at Rome to present their bodies a living sacrifice to serve God. Romans 12:1, “I beseech you therefore, brethren, by the mercies of God, that ye present your bodies a living sacrifice, holy, acceptable unto God, which is your reasonable service.” Obviously they hadn't surrender their will to the Lord at the time of salvation. They hadn't made a commitment to live for Christ. I'm so sick of hearing stubborn pastors and assistant pastors defend the modern corrupted Bible versions, claiming that most people cannot understand the King James Bible and need something easier to read. Consider the following comparison between the KJB and the ERV, and you will see how stupid their claims really are . . .
What in the world does the ERV mean? It is completely retarded? Why would Jesus tell Mary Magdalene that she doesn't need to hold on to Him, because He hasn't yet gone back to the Father? SHAME ON THOSE WICKED PASTORS WHO PROMOTE THIS CRAP AS EASIER-TO-READ!!! The ERV, as are all modern PERversions, is so retarded that it doesn't matter how easy it is to read, because the comprehension rate is down close to 50%. So much for a pastor who is a “professor.” Ha, let me tell some more jokes! Now the King James Bible says Jesus told Mary not to touch Him, because He hadn't ascended to the Father yet. Hebrews 9:12 and 24 teach us that Jesus “BY HIS OWN BLOOD” entered into the heavenly Holy Place on our behalf, to sprinkle His precious blood upon the Mercy Seat (Hebrews 12:24) in the presence of the Father. If Mary had touched Jesus, she would have corrupted the blood sacrifice. Now that makes perfect theological sense, because that's the truth. If you are using the ERV (or any modern corrupt version), as is the ungodly Harvest Baptist Church on Guam, you must now make a decision to either get right with God and stop using it, or continue in your apostate condition, because you just don't care about the purity of the Word of God. The only Bible for me is the precious KING JAMES BIBLE!!! Thank you dear Lord God for your awesome holy, inspired, inerrant, infallible, preserved, Words!!! 2nd Thessalonians 2:10 tells us the reason why the masses of this world will be deceived and follow after the Antichrist when he comes... “BECAUSE THEY RECEIVED NOT THE LOVE OF THE TRUTH, THAT THEY MIGHT BE SAVED”!!! If they would have loved the truth, they would have believed the Gospel, and so they also would have been raptured. Instead, they were left behind, and now they will follow the Antichrist! Many of those masses of people left behind will be THE CHURCHES. All of the Lordship Salvation churches will be left behind, because THEY RECEIVED NOT THE LOVE OF THE TRUTH, THAT THEY MIGHT BE SAVED”!!! Go ahead, don't listen to me—trust in your changed life, forsaking evil ways and confessing Christ. Good luck with that! The satanic new Bible versions are fueling the heresy of Lordship Salvation. I am telling you the truth my friends, will you heed the warning? It is so simply and easy to be saved that most people walk right past the narrow gate. Few there be that find it (Matthew 7:13-14). They're looking for a big fancy door into a big fancy religion. They're looking for a religious door that makes them feel spiritual. They're looking for a door with an entrance policy, who won't let you in unless you're clean-shaven, sober, moral and intend to live a clean life if they let you in. They're looking for a door with flashing neon lights, something spectacular. None of these doors lead to life. The only door into Heaven is Jesus, a little pathway, which is obscured by the all the other attractive gates, religious entrances, big doors and bright paths with their owners clamoring for their attention, shouting “Enter here!,” “No, over here, come in here!” Little do most people realize that Satan owns all those buildings! All except one, that little humble path, Jesus! I often feel lonely standing for the truth, when hardly anyone stands. Most pastors, churches and Bible colleges today don't have any interest in debating which Bible is God's Word. So they just support all of the Bibles, not exposing or criticizing any of them. The reason why they lack that passion is because they lack faith. If we truly believe Psalms 138:2, that God magnifies His Word above all His name, then we would care. I CARE! The Bible is very important. Even the slightest subtle changes alter the meaning of a passage of Scripture considerably. Woe unto today's pastors who don't care, just going along to get along. I picture nearly all of today's churches as being aboard a big ship. On the side of the ship it reads, “Mainstream Evangelicalism!” There are hundreds of Bible versions aboard the ship. There are dozens of different plans of salvation taught by evangelicals like John MacArthur, Rick Warren, Chip Ingram, Ray Comfort, William Lane Craig, Paul Washer, Billy Graham and others onboard. Everybody aboard the ship is going along to get along. Nobody exposes or criticizes each other. Everybody is comfortable, enjoying all the splendors of the luxury ship. They all draw near to God with their mouths, and honor God with their lips, but their heart is far from Him, teaching manmade doctrines. This ship's captain is Lucifer! Anything goes on Lucifer's ship. It doesn't matter which Bible version you use. In apostate churches, it doesn't matter which plan of salvation that you choose to believe. Everybody is taken care of and prospering. Have you been deceived? What satanic imposter are you holding in your hand at church on Sunday? Boy, of ever there was a lie, it's the following translation from the ERV. Notice how they deceitfully changed the Word of God to exonerate themselves. They are corrupting God's Word, which is what 2nd Corinthians 2:17 warns against in the KJB. So the ERV changed it to “selling God's Word for profit” instead! The ERV company, World Bible Translation Center (WBTC) is in trouble with God for corrupting His Word. It's not a sin to sell God's Word, it's a sin to corrupt it, whether you sell it or not . . .
Just as there is a Biblical curse upon every false Gospel, so also is there a curse upon anyone who changes the Word of God, and the foolish pastors who uses such corrupted Bible versions are cursing their congregation, and bringing God's curse upon them as well. Whose side are you on my friend? You cannot be on God's side and support heresy at the same time. Jesus told the Samaritan woman in John 4:24 that God can only be worshipped in spirit and truth. The world is filled with false religions who worship God in vain (useless worship), because they teach for doctrines the commandments of men. They are deceived of themselves, playing religion, cursed by God, on their way to Hell in a partial-faith-in-Christ-plus-human-effort plan of salvation. Jesus warned in Luke 13:23-24 that many people will seek to enter into Heaven in eternity, but will not be able. Matthew 7:21-23 plainly tells us that those who trust in Lordship Salvation will NOT be granted entrance because they failed to rest completely in the Gospel of the Lord Jesus Christ! You need GOD'S RIGHTEOUSNESS (Matthew 6:33), and not your own self-righteousness (Romans 10:3-4). Get mad at me if you want, I'm sick of lukewarm churches and Bible colleges. God knows my heart, that I have nothing personal against Bob Jones University, nor anyone at or from BJU. I'm just taking a Biblical stand against the apostasy in our churches today, who are being trained at BJU and other religious institutions. Does it matter what we believer? Since everything we believe as Christians is based upon the never-changing Words of God, shouldn't we be alarmed and angry that Satan is CHANGING the Bible to make a buck? The Southern Baptist Convention stopped using the NIV, because now they've published their own Bible PERversion, the Holman Christian Standard. It has all the same corruptions as the NIV!!! They're only fooling themselves!!! Why aren't today's churches and Bible colleges taking a stand against the tampering of God's Word for money??? It's an important issue, the most important, because by changing the Bible's meaning, a whole new set of doctrines are arising in today's apostate churches!!! Kindly, Bob Jones University claims that they've held the same position on the Holy Bible since 1927 when they began their college. WE'LL THEY'RE WRONG! They were wrong in 1927 and they are wrong today! I recently heard Bob Jones III preach a sermon over the radio, in which he said that as a child he was required by his parents to stand in front of the television (to block it) if a beer commercial came on. I wish I could stand in front of Bob Jones University and block the churches from seeing them (i.e., block out Bob Jones University), until they repent of their sinful support of the corrupt Alexandrian Bible revisions. BJU sells the corrupt English Standard Version (ESV) in their campus bookstore. Look At The Perverted Garbage that Bob Jones University Sells in their Campus Bookstore! There's two types of church members—those who do all the work, and those who let them! We're at spiritual war, and most professed believers are letting the tireless few do all the fighting! We've got too much religion today and not enough truth! We've got too much churchianity and not enough Christianity! Billy Sunday saw back in 1914 that the churches were lagging behind, going back and lacking persecution as Christlike Christians ought (2nd Timothy 3:12). God hasn't changed. The Holy Bible hasn't changed. The world is constantly changing for the worse. As the world waxes worse and worse, Christians cannot remain neutral without sinfully dipping their sails in compromise. Satan is blatantly butchering the Words of God, and most churches are silent, even supporting the counterfeit versions. Well, at least one born-again Christian is taking an uncompromising stand for God and truth. If you don't have a King James Bible, you don't have a Bible!!!!!! !